I stumbled across this video earlier this week. It's really stuck with me. It is quiet, meditative, purposeful, inspiring. I began thinking about the local impact of pottery- in terms of my local economy (including but beyond my family), local influences (people, seasons, materials), and I was particularly struck by a scene of this potter digging clay to use in her decorations. Several years ago my family camped at a state park on the banks of the Mississippi river. We spent a day on one of the sandbars and found deep, dark, iron-rich clay veins running throughout the sand. We all marveled at how black and sticky it was, took note, and went home. Later in the season we returned with small shovels and buckets to bring some of that clay home. I made a few test bowls to see how this local clay would fire, closed up the bag and forgot about it. Because I work with light clay bodies, switching between light and dark clays is problematic- all of your tools, wheel, bats, etc have to be thoroughly cleaned when switching between clays to prevent mixing that is either ugly (dark or light streaks showing up unexpectedly) or catastrophic (some clays have different rates of shrinkage and absorption- this means explosions in the kiln or bubbling glazes, or cracks, none of which makes this potter happy). Returning to the video, I thought about this stash of dark local clay in my studio, pulled out a small jar, and made some slip. I'm experimenting with using this dark clay as an inlay. I only decorated two tumblers that I'd made with this local slip- we'll see how it works. Local is very important to me- I try my best to support local food and farmers, shop at local small businesses, but all of my supplies come from who-knows-where. I'd love it if this works and I could add this to my regular work. A second thing that stuck with me was the artist's statement that "we have enough things already in this world" and she is careful about what she makes. Is everything that I make worthy of firing? The energy expended by the kilns, the materials rendered from the earth? The money I've spent on clay and glazes? No. So no more firing of warped bowls, pieces with design flaws or drawing bloopers. Seconds happen (speaking of, that kilnload of ^7 cups didn't heal. The chicken platter was better, but the cups were still crackled from too-thick glaze on bottom). Most of my flawed pieces go into a smash bin for mosaic work, but I don't want to put time or energy into firing pieces that I know are flawed before they are fired. Lots to think about. Have a nice weekend friends. I'm returning to my quiet. This trip was fantastic. I toured Heath Ceramics (This is such a wonderful small company. Everyone there was so incredibly kind and open and I learned SO MUCH), several individual pottery studios (Diana Fayt, Fourth and Clay, the studio of Josie Jurczenia, Rae Dunn, and Christa Assad), and Trax Gallery, which is both a ceramics gallery and studio for Sandy Simon and Robert Brady. There was a drive-by of Whitney Smith's studio and shop in Oakland. Bought unavailable-locally glazes, underglazes, and tools. Spent several hours at SF MOMA, which, happily, featured a ceramics collaboration . I returned home inspired to clear my plate of my obligations (this week will be a veritable glazing festival) so that I can work on new pieces, using new techniques I learned on the studio visits and try my hand at adapting some pieces that were particularly inspiring. I am ever grateful to Diana Fayt for sharing her time, knowledge, and passion for this medium with me, and even more grateful to call her my friend. to say that I am thrilled with these is an understatement. Bisque firing a bunch more of these today. This weekend I also went to see this show and lecture. I bought the book that accompanied the show, which is something that I rarely do, but I think I'll go back to it over and over again. I drew and took notes furiously throughout the lecture- not so much on this potter's style- it was very much in the folk, utilitarian style of the NC mountains (read- really, really thick), but he used a slip-painting style that was reminiscent of Wedgwood Jasperware (without knowing about Jasperware) and crystalline glazes. Crystalline isn't something I'm interested in pursuing- they're not really food safe- almost, but not quite, too soft and leachable, and frankly, too finicky in the firing. I'm not into finicky. Nope. But I did fall in love with how they cascade down the shoulders of large vases, and that, friends, is something I can draw. If you're in Memphis, the show runs through mid-November. There's also a nice impressionist exhibit up through Oct 9. I got back on my wheel for the first time in two weeks. I have been itching to throw again. I really, really need to glaze this week, but what I wanted to do was throw. I managed about an hour and a half- two taller cylinder vases, more eggs, some tiny bowls, and a honey pot. I need to take this vase upstairs and put it up by my wheel so that I can work on this form. Or perhaps it would be best handbuilt, like my new salt cellars. This was my mother in law's, probably from when she was a child or very young adult. It is Japanese export, very old. I'm not sure if it is the square shape and fluted texture that I like (probably) or if it is the burst of orange (not usually my color, but it works here) that appeals to me. 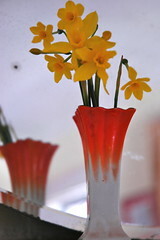 I think I talked about these antique jonquils last year. They came from Sisters Bulb Farm in Louisiana, which sadly, (really, really sadly, because they grew a huge variety of antique daffodils) is now closed. The really tiny ones are called "Early Louisiana", and I tell you, just this small clutch of 6 flowers has been enough to perfume my living room all week. I adore them. Hope you have a lovely spring week- it will be a busy one for me, but I do hope I'll have new work to show at the end of it. Advent is my favorite "season." It is a quiet time for waiting, reflection, preparing. I love it. A peek of light in the darkness, speaking of good things to come. Yesterday we had our annual advent wreath workshop; this year, little boy did the wreath almost entirely by himself. I usually have very specific ideas of what I want, how I want it to look, but I let go and let him create this year. Letting go, preparing, waiting is my own personal theme for this advent season. It is hard to do that- I HATE letting go- but the results always pay off- in beautiful memories and unexpected blessings. I went to a women's college in Winston Salem, founded by the Moravian church. Advent was very special in Old Salem, celebrated with beautiful white stars hanging in doorways, lots of beeswax candles, and greenery. It was simple and lovely. I've taken my cues for Christmas decorating from my four years in this special place- I don't put up our tree until midway through December, but our advent wreath is out, my simple advent calendar comes out, and in years past, I've hung a Moravian Star over our doorway. Sadly, it died last year (after eight years of advents) and I never got around to replacing it. This year's advent preparations are more simple, and hopefully more meaningful. We've cut back on the extraneous- both gifts and activities. We're giving fewer, simpler, and more handmade gifts. I have some sewing to do, more pottery to make, and a bit of knitting to finish. I spent a large chunk of Saturday afternoon finishing rolled beeswax candles and making some paper star ornaments for packages. The smell of beeswax and the golden light these candles make me happy and fill me with hope. That's what advent is about- letting go and quiet, hopeful waiting and watching for the bright future. 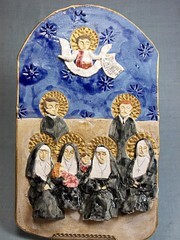 Here, finally, is the 90% completed icon for the Martyrs of Memphis that will go home this weekend with the Sisters of St. Mary's in Sewanee, TN. I finished the gold portions today*, ironically, on the feast day of Constance and her companions. I've shown you pictures of this and my other version of the Martyrs icon before, but I'm not sure I've explained why I'm so fascinated with this group of mostly women (but including men) featured here. I attend St. Mary's Episcopal Cathedral**, located at the fringes of downtown Memphis, TN. It is in the medical district (appropriately, given its history with the Yellow Fever Epidemic, when over 5,000 Memphians died), bridging bustling downtown, impoverished neighborhoods, three hospitals, and numerous social-service organizations, including several missions for the homeless. During the 1978 Yellow Fever Epidemic, St. Mary's (a mission church of the larger downtown Episcopal church, billed as a "house of prayer for all people" because its parishoners weren't required to buy their pews, attracting members of lower socio-economic status) opened its doors to those orphaned by the fever. The Sisters, led by Constance, ran a school for girls. When the epidemic struck, Constance and Thecla were safely on vacation but returned to nurse the poor (for everyone of means left the city posthaste), sick, and dying. They worked until they, too, were struck with the fever. Charles Parsons was rector of Grace Church in Memphis and served with the sisters. Louis Schuyler came to Memphis from Hoboken, NJ, to serve at St. Mary's and died 10 days after he arrived. Sunday night I finished Molly Crosby's excellent American Plague, a history of the Yellow Fever, it's multiple epidemics, and the scientists who worked to discover its roots and develop a vaccine. The story was mind-boggling. The sacrifices of the priests, nuns, doctors, and scientists were nothing short of enormous. At the top of the icon, an angel holds a scroll with the verse from John 15:13 "no man has greater love than this, than to lay down his life for his friends." * I had completely forgotten what the actual date of the Martyrs feast was until I was contacted by Fr. Miguel Zavala Mugica, who requested permission to use the image of one of the icons for his excellent (but written in spanish) blog. **St. Mary's also played an active role in the 1968 Sanitation Workers' strike and the Civil Rights Movement in Memphis. Dean William Dimmick carried the cathedral's processional cross in an inter-faith march to city hall the day after the Rev. Martin Luther King, Jr. was slain. It split the church, but many of those who stayed were dedicated to social justice issues, specifically involving the sick, the poor, and the homeless. There are several magazines that I subscribe to with the laughable goal of being "on trend." Sometimes I'm ahead of the curve slightly, but mostly I make what I make and these magazines are eye candy. This little teacup and saucer, from Anthropologie, has been in Domino twice in the past couple of months. Really, it reminds me of the tumbler and bowl I bought from Molly Hatch and her now (sadly) empty etsy store. So I love it, they come in different colors, and it's a very good thing that there aren't Anthropologie stores in Tennessee (that I know of, and please don't inform me if there are) and that I no longer get the catalog, becuase I love their home goods but they, ah, prevent me from attaining my goal of a clutter-free home. Originally, I ripped this out to see if I could make my own variation of it, but at this point in time, it seems that I will be making nothing but berry bowls for the foreseeable future. Not that I'm complaining! I'm going to attempt one, maybe making similar lines with a blue underglaze pencil, or make a blue one with white lines. . . in the fall. Today I have my mother's helper, but all the pottery I'm going to make for my sale is made. I have more berry bowls for orders to make, but not today. I've done 26 this week, both for orders and my own sale, but today's task is herb markers, finishing sale postcards, and listing the pieces that I photographed for etsy on Monday (while I catch up on my podcasts!). Thursday was an all-day little boy fiesta. We went to the library, out for lunch, went to the barber shop for our first professional haircut (and silly mama forgot her camera), to a playdate, and then to the pool for a swimming date. We finished the day by catching fire flies at dusk under the trees at Rhodes College, and reading books in mamas bed until we passed out. Literally. I woke up with books around us and the lamps still on. Ahh, summer. I made a few of these little bowls- one larger than my cafe au laits, one teeny one (this one is 2" tall, 2.5" in diameter at the top) and a tumbler. As I look at it now, this bird stamp, which I made for some St. Francis icons, looks a bit like an airline logo. Maybe it's just the position and the royal blue. Or maybe I'm just tired after a very full weekend. The larger bowl has a robin's egg blue interior and bird, the tumbler is all white with a blue bird. I like the clean lines, white exterior, and colored interior. Somehow, though, it almost doesn't look like my pottery to me. Not bad, just a stylistic departure. But not sure how exactly, though. That last birdy piece sold before I could even pack it up to take to the farmer's market. Thanks Michele! I'll have to make more. I do like that style. Have a great week, everyone. I'm teaching again this week and next. Between that and farmer's market preparations, I'll be around less, but you'll still hear from me. 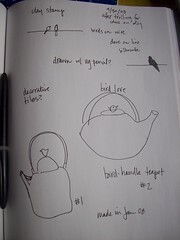 Yesterday, in my sketchbook, I showed you a picture of a bird-lidded teapot. It just came out of the kiln, and is the same one that I showed you and talked about way back in January, inspired by Laura Norris's fun bird painting. Well, here it is. I was pretty pleased with how it came out- This one will be for sale, but I haven't priced it yet. For more detailed pictures, go here. yesterday afternoon, while little boy was watching his coveted 30 minutes of pbs kids, I spent some time wandering around etsy and flickr, looking for ideas. I frequently look for "bee," "bird" and "pottery" to see what other people are doing with my favorite themes. Lately I've been all about the birds. When we go on walks I pick up the newly hatched egg shells from robins and mocking birds, marveling at the intensity of the blues. I found a tiny tiny blue jay feather that is resting in my kitchen window. It only makes sense that I'd put these things that inspire me in my pottery. Two things I noticed- small birds perched on the rims of bowls and/or used as knobs, both of which I already do, and paintings or drawings of silhouetted birds perched on a wire. Because I don't want to copy anyone else's work, blatantly or otherwise, and because I really don't draw or paint freehand on my work (that tends to impede production), I started thinking about how I could make this image my own with clay stamps like my little bee logo stamp. The lone dove (because those are the birds I see perched outside my window most often) will probably be the image that I use for the stamp, and I really like the idea of the line continuing around the entire piece. I'm thinking of a bowl or mug with a small thin line carved around the top of the piece as it rotates on the wheel. We'll see how it goes. Last summer I made a series of leaf teacups for my boy's mother's day out teachers, as well as the librarian who we saw every week for 2 years at the toddler story hour at the main library. I think I made 6-8 of them, let them sit around for a while, then finally put them up on etsy in the last week or so. You've already seen a couple of my favorites- one with a big beautiful fern (that I broke and may try to fix for my own use), and one with a Japanese Climbing fern. 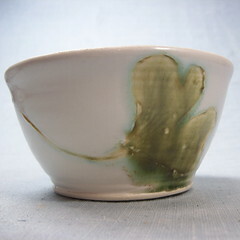 I had serious reservations about putting this one up because I was so unhappy with how the glaze slid off the leaf and pooled at the foot of the cup. Ruined, I thought. A waste of a ginkgo, I thought. I LOVE the ginkgo tree. The tall stately sculptural shape of the tree itself, the fan-shaped leaves, its ancient history, and the fabulous golden fall coat it puts on every year*. My neighbor transplanted a small ginkgo from her backyard to her front yard shortly after we moved to this house in 2004. It thrives in the east-facing yard, and serves as a handy-dandy source for leaves for my pottery. Her neighbor also has a tree, so I may never be without! I called in sick with a stomach bug this morning and went back to bed after dropping little boy off to school. When I awoke, in a sleepy queasy fog, I turned on the old mac and was shocked to see that this piece had sold. Thank you, Dane, for giving my poor drippy child a home. I am always surprised when the things that I perceive as sub-par are among the first to leave my "nest." *Before I had my son, we lived way out in the country and I would drive into the city to teach clay residencies in the city schools through what was then the Center for Arts Education, an arm of the Greater Memphis Arts Council. Sadly, this program folded in 2003. I remember driving into midtown to reach a specific school just before Thanksgiving to drop off the children's pieces. I stopped the car in front of a huge ginkgo that was beginning to lose its leaves, a golden tree with a golden carpet. On impulse, I filled the entire back floorboard of my car with ginkgo leaves. Half of those leaves made it into pottery, a quarter stayed in the floor just to make me smile that winter. a while ago I posted a picture of the goodies my miniswap partner, Amanda, sent my boy. This weekend she started a new blog- Owl and Pussycat. Our swap package was filled with fun things to play with, eat, make, read, and listen to, all based on her little family's favorite places to go in Vancouver. I look forward to seeing what creative goodness Amanda sends our way. One of my first blog posts was about my dear friend Katharine's sister, Laura, who inspired me to work harder at pottery and at creative mothering. At the time, the painting, Night Chorus, pictured above, was the placeholder for her website. I've just discovered that the site is up and running! Please go and visit Laura's site and meander through her beautiful, folksy paintings that celebrate the everyday. This is number one on my list: the French Duralex Picardie glass. I tried to throw and flute some, but they just didn't work for me. I bought a few for a quarter each at a thrift store, having long been obsessed with the form* (just like the cafe au lait bowls), was thrilled to discover their name, then dismayed to find out that they were no longer manufactured. Oh, there's still a version being made, I just don't like the "new" form. It's very square and boxy at the top, better for stacking, I think the idea was. I bought all that was left in 4,6, and 12 oz sizes at the local Williams-Sonoma outlet, but that only bought me 6 small glasses and 3 large ones. I'll be adding to the collection as I find them because they are fabulous. I dropped a 4 oz glass on the bathroom floor the other day- it bounced, didn't break. Everything breaks on 1920s tile! I'd like to send a huge thank you to Patricia at A Little Hut for her praise and beautiful presentation of my bamboo tumbler. At my house, if you don't see a picardie glass in my hand, you'll find a bamboo tumbler. Thanks, Patricia. *My plug for industrial design, this is. Also, as an aside, I'm teaching a sculpture unit right now at the museum. A student pulled me aside yesterday and whispered- is that really a trash can? It was an Alessi, I believe. I wish there had been time to talk about industrial design, but all I had time (and energy, due to my recovering but still present stomach flu) was a whispered-back "yes!" This sweet little pitcher was a Christmas gift from my friend Katherine. It came with 7 small bowls and may well be one of the nicest gifts I've every been given. The set was made by Lee and Pup McCarty, famous Mississippi Delta potters, sometime in the late 1960s. Dr. and Mrs. McCarty are unfailingly gracious- I see them a half-dozen or so times a year in Memphis at the library, the museum, and at the farmer's market. Every time I see them I feel quite a bit like I've just met Brad Pitt- I gush, am flustered, and generally act starstruck. And, because they are so gracious, they always seem to remember who I am. Most Mississippians know McCarty pottery. Many Mississippi brides (though I am not a native of the state, my husband and I met and married in Oxford, so I feel as though the state, with all of its faults and glories, is a part of me) receive at least a piece or two of McCarty pottery as gifts. Gary and I were fortunate to receive quite a lot of it. The simple, sculptural forms, bold cobalt (also jade or nutmeg, as seen here) matte glaze, and useful nature of this pottery inspired me to try my hand at the wheel after we left Oxford and I was between jobs. I never dreamed that I would make my living from pottery when I began in 2000, nor did I imagine I would be able to tell Dr. and Mrs. McCarty how much they influenced me. My personal pottery style changed rapidly from mimicking other potters to finding my own expression in mud, but I can clearly see their influence- especially in this tiny bird-like form. I do enjoy using my McCarty every day- our sugar bowl, tea cannister, and ramekins are all theirs. This pitcher is filed with a few short twigs of winter honeysuckle (lonicera fragrantissima) from my neighbor's yard. It blooms every January and fills a room with its sweet lemony perfume. The small, wavy black line on the pitcher is one of the signatures of McCarty pottery- it represents the Mississippi River and can be found on the vast majority of their functional pottery. If you are ever in the Mississippi Delta, it is worth your time to take a side trip to Merigold, where the McCarty studio and gardens are located. We went down for my 29th birthday, four years ago, and even in mid-March the gardens were fabulous. The McCartys are wonderful artists and fine people; I am grateful for their influence on my life and craft.